Aloha bloggers! 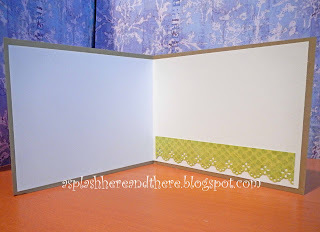 This is Melody from A Splash Here and There blog. Today's my day to share my project with the readers here at the Bugbytes. I just got back from a Hawaiian vacation and still on vacation mode. I made this simple card for my next door neighbor and her husband who helped watch over our house while we were away. It was so easy! There was no die cutting machine involved and I used some of my scraps. This card is an A2 sized card, so it is 4.25 tall x 5.5 wide. 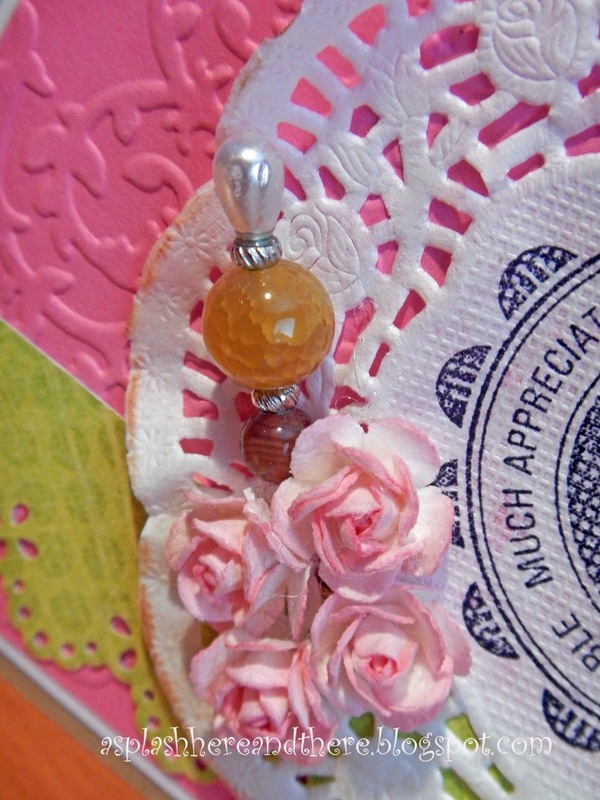 The base I used for the card was plain kraft paper, then sized a white mat at 4.125 x 5.375 to fit on the front. On top of this mat, I cut a pink CS from my stash sized at 4 x 5.25 and ran it through the cuttlebug with one of the Paper Lace II folders. I also found a strip of 1 inch green patterned CS , sized two with the length of 5.125 inches, punched one length with a MS puncher (I think it's called lace) and put one in the front and one on the inside of the card. 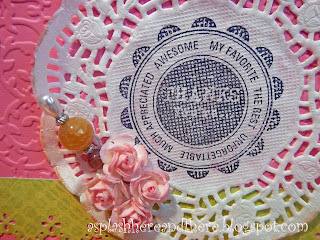 I stamped a store bought doily with a CTMH stamp in black ink. Then I glued 4 pre-made pink rosettes (bought from Michaels) and stuck a homemade stick pin that had been collecting dust in my craft room and put six pink half pearls to finish off the front of the card. And here's a peek at the inside of the card. I inserted a mat to write our sentiments in and attached the other strip of green CS punched with the Martha Stewart puncher to finish off the inside. Thanks for looking at my very easy project for today! Thanks Pam for having me over your blog. Until next month! Beautiful card!!! Simple yet stunning!